Do you ever think about what happens to a drop of rain that falls onto the ground? It may land on a tree and evaporate; it may land on a farm field and be absorbed into the soil; or it may land on a rooftop, driveway, or road that travels down the street into a stream or storm drain. Any precipitation in an urban or suburban area that does not evaporate or soak into the ground, but instead pools and travels downhill is considered stormwater. Stormwater is also referred to as urban stormwater runoff and polluted runoff. 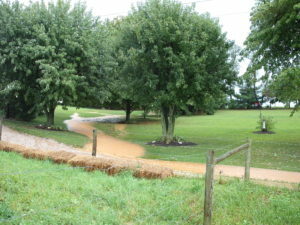 Increased development across York County’s watersheds has made stormwater runoff the fastest growing source of pollution to the creeks, river, and the Chesapeake Bay. Adopting and implementing stormwater management ordinances that control both the quantity and quality of stormwater runoff. Adopting open space policies that encourage natural vegetated areas and minimize impervious areas such as parking lots, streets and roads. Adopting riparian stream buffer ordinances that encourage vegetated and forested buffer areas along streams and other water bodies. 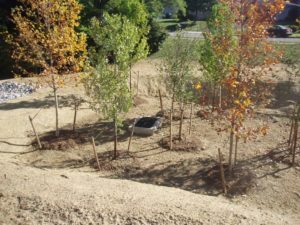 Using structural and vegetative practices during construction such as sediment basins, silt fencing, and temporary gravel construction entrances. Using post-construction BMPs such as detention basins, constructed wetlands, grassed waterways, sand filters, retention ponds, municipal street sweeping, storm sewer inlet filters, and oil/grit separators. Implementing good housekeeping practices at home and work such as proper lawn care, the use of low-phosphate detergents, and the proper disposal of household chemicals. Department of Environmental Protection’s Citizens Resource page. For more information about York County’s Watersheds contact Gary R. Peacock, Watershed Specialist, at 717-840-7687 or e-mail gpeacock@yorkccd.org.